1-of-11) Classs 20 Bo-Bo diesel locomotives nos. 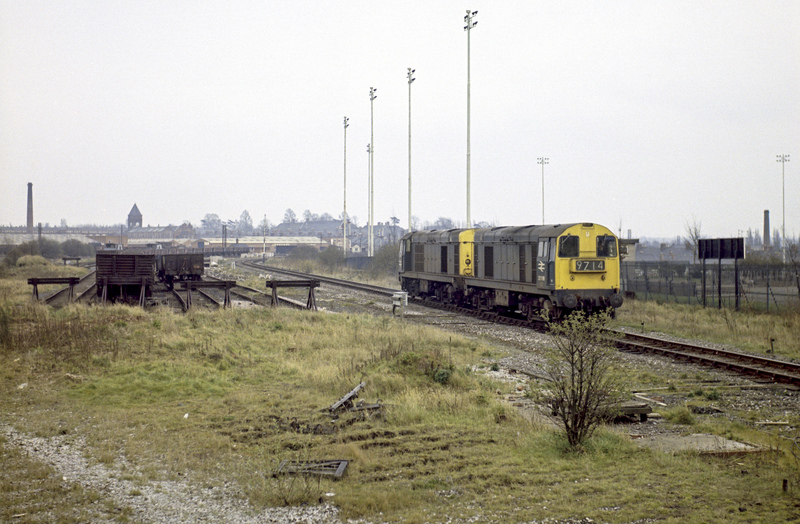 20199 & 20005 depart from Knighton Junction, Leicester, and head west on the Leicester to Burton line, 13/4/75. 2-of-11) Class 20 Bo-Bo diesel locomotives nos. 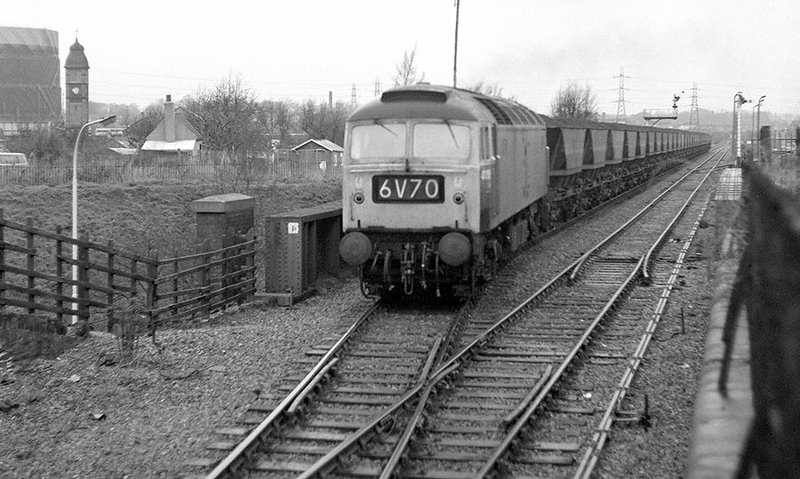 20156 & 20165 are travelling east on the Burton to Leicester line and, having just crossed the bridge over Saffron Lane, are approaching Knighton Junction, Leicester, 14/1/75. By this time, the line to the left was the main line, while the track to the right led to Leicester power station and the chord down to the ex-Great Central line. 8-of-11) 0-6-0 diesel shunter no. 08619 propelling the wagons now loaded with scrap from the ex-Great Central goods yard, along the Burton to Leicester line towards Knighton Junction. At the junction the train will reverse before continuing to Leicester, 29/12/75. 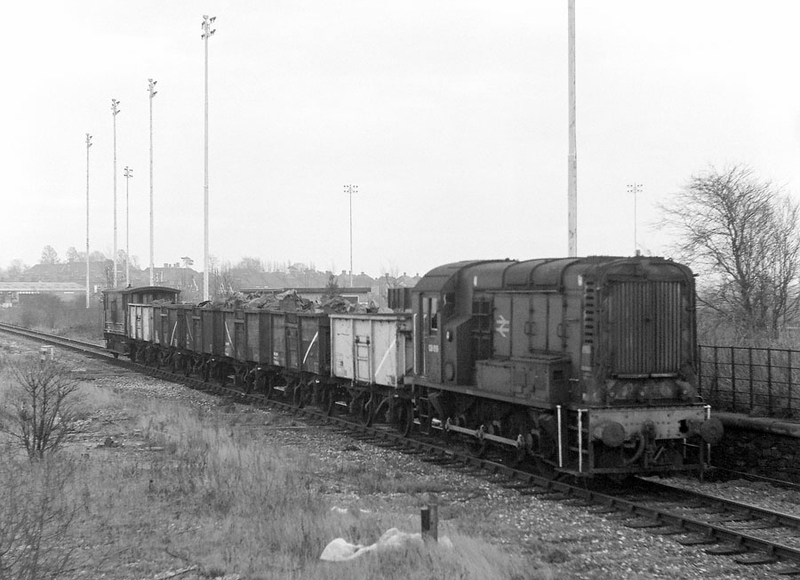 5-of-11) The train in the previous photograph has now paused at the junction near Saffron Lane, on the Leicester to Burton line, while propelling empty wagons to be loaded with scrap in the ex-Great Central goods yard. The guard goes ahead on foot to supervise the movement at this junction towards the chord down to the ex-GCR line, 30/12/75. 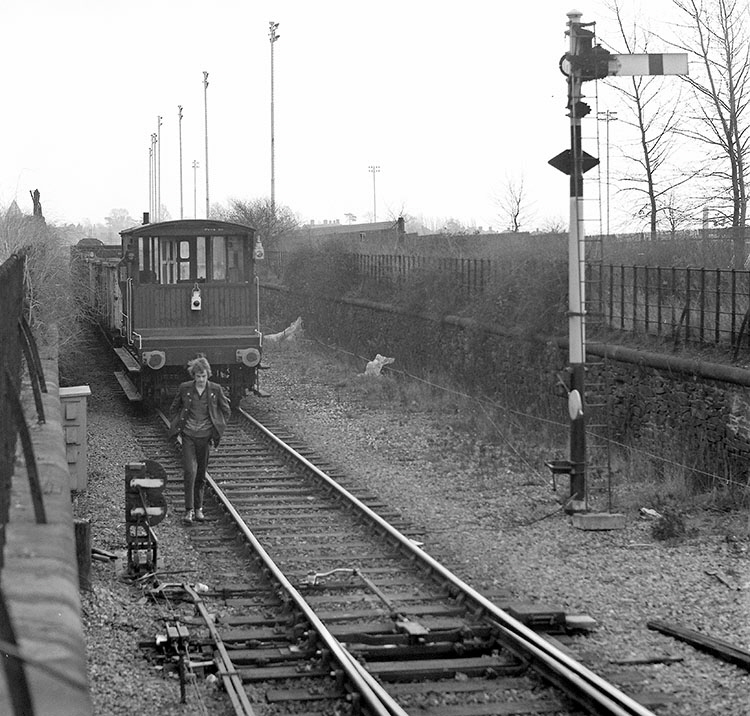 6-of-11) At the junction with the Leicester to Burton line at Saffron Lane, Leicester, 0-6-0 diesel shunter no. 08619 propels empty wagons towards the chord down to the ex-GCR line, 31/12/75. The wagons will be loaded with scrap in the ex-Great Central goods yard. 3-of-11) An unidentified class 47 Co-Co diesel locomotive crosses Saffron Lane bridge with a "Merry Go Round" coal train on the Burton to Leicester line, 31/12/75. 4-of-11) 0-6-0 diesel shunter 08619 approaches the junction near Saffron Lane, on the Leicester to Burton line, while propelling empty wagons to be loaded with scrap in the ex-Great Central goods yard. 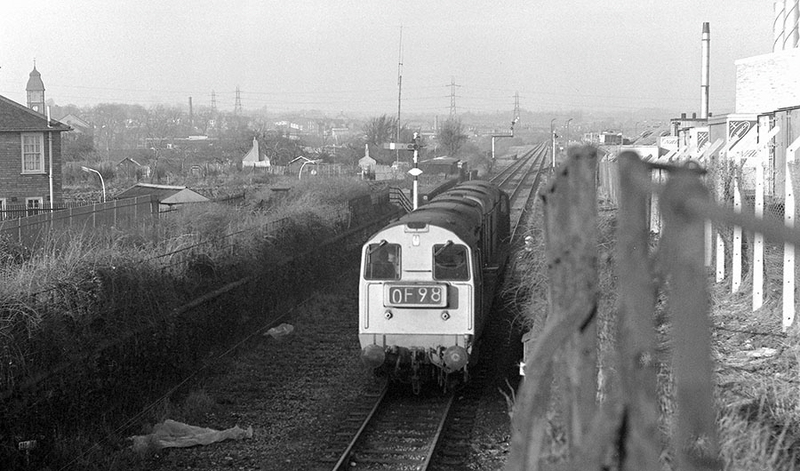 It has come from Knighton Junction in the background, 30/12/75. There used to be a footpath alongside the Leicester to Burton on Trent line from where it crossed Saffron Lane towards Knighton Junction. This made a convenient viewpoint for trains along that line and also the trains for scrap to and from the ex-Great Central freight yard off Western Boulevard. 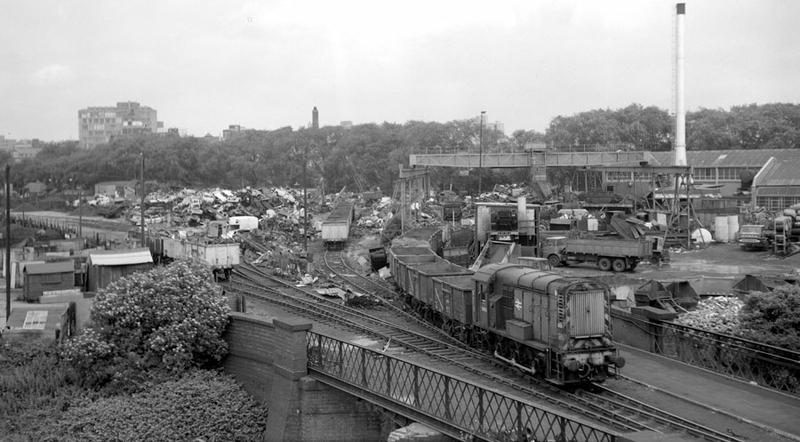 For many years the scrapyards on the site of the ex-Great Central freight yard off Western Boulevard supplied a steady flow of trains of scrap. Below is a sequence showing the progress of some of these trains to and from the scrapyards, though not all on the same day. 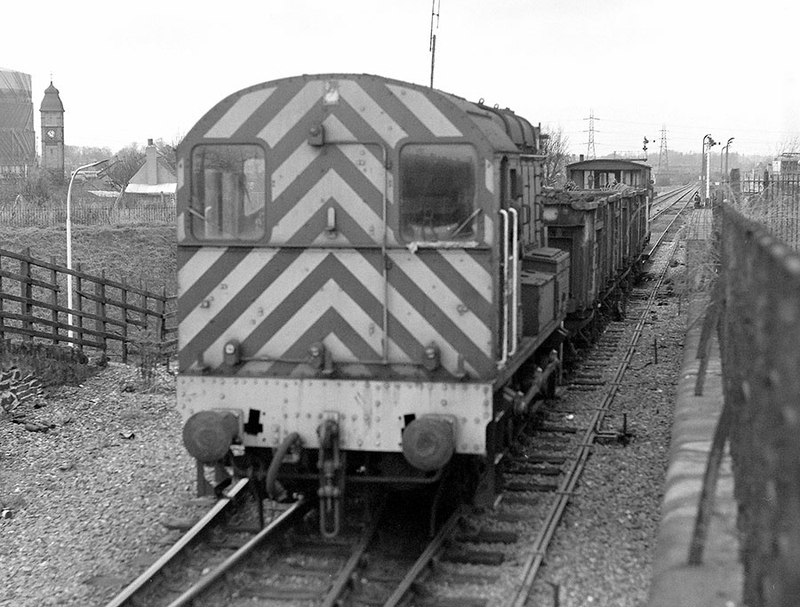 7-of-11) 0-6-0 diesel shunter no. 3400 shunts the A.E. 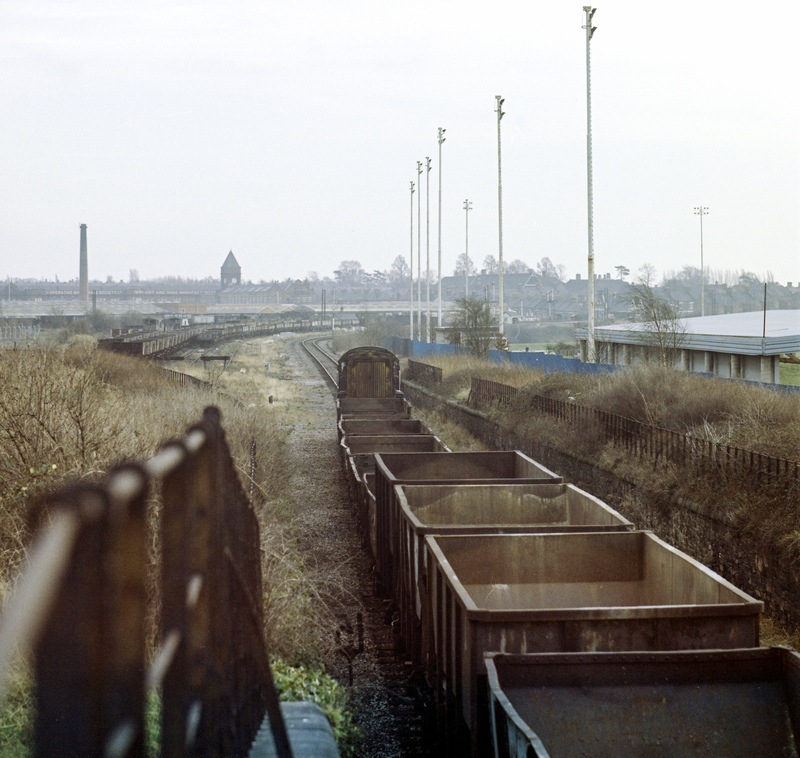 Piggott and Frank Berry scrap sidings, on the site of the ex-GCR goods yard, Leicester, 3/7/74, photographed from Upperton Road bridge. When loaded this train will be propelled up the chord to the Leicester to Burton line before heading to Leicester Midland via a reversal at Knighton Junction. 9-of-11) Having reversed at Knighton Junction, 0-6-0 diesel shunter no. 3400 returns to Leicester past Welford Road with the train load of scrap that it has put together in the scrapyards on the site of the ex-GCR goods yard, 3/7/74. 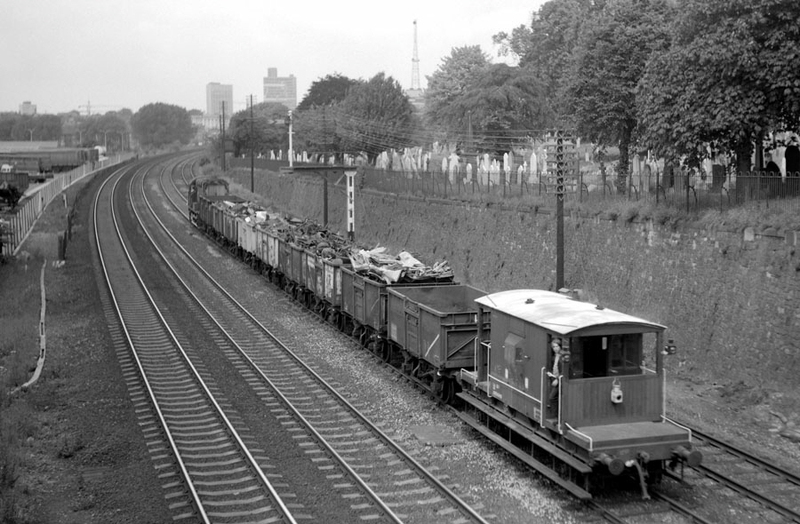 More photographs of trains around the scrapyards on the site of the ex-Great Central goods yard are shown at http://www.gcrleicester.info/html/trains.html. 11-of-11) Class 47 Co-Co diesel locomotive no. 47322 heads east with a 'merry go round' train past the foot crossing near Western Park, Leicester, 21/4/76. 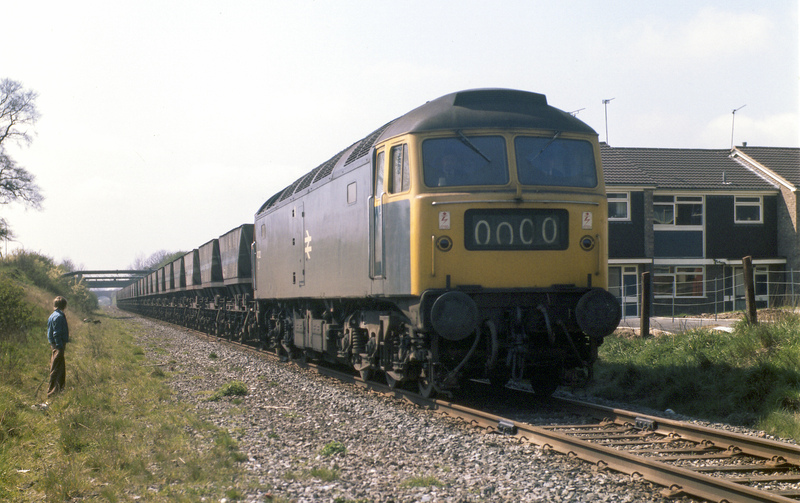 10-of-11) Class 20 Bo-Bo diesel locomotives nos. 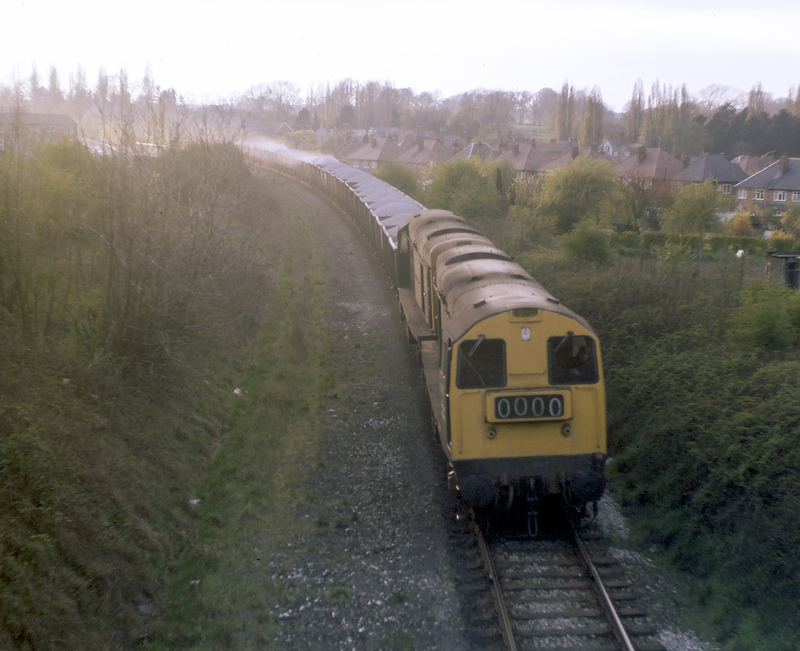 20157 & 20170 head east in the dusk with a train of granite chippings near Western Park, Leicester, 21/4/76. Dust from the chippings is blowing off some of the wagons.